During a visit to the Leipzig Trade Fair, a filthy rich oil sheik heard that there is a car with a delivery time of over ten years. Since Rolls Royce usually delivers more quickly than that, it must be quite an exceptional car, which he would certainly have to have in his collection. 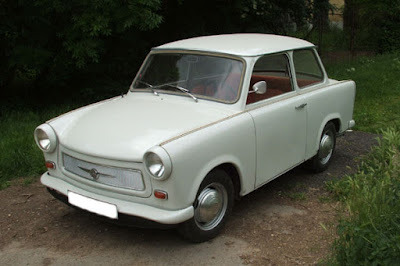 Sight unseen, he made a request to order this Trabant. In Zwickau, they're aware of this great honor,So the Car Company immediately changes the running Five-Year Plan and bring forward a specimen. In the container, the car reaches the emirate in a handful of weeks. The happy oil sheik immediately called his friends together, opened the container, and exclaimed in surprise: "Gosh, they have incredibly long delivery times, but at least they send you a cardboard model in advance — and the best, you can even drive it!" Similarity between a coalition govt, a diva's bikini and a bear market rally - People want all of them to fall and keep wondering whats keeping them up..
thank you and wish you all a great festive season! well, all I can say is, love and the stock market were made to defeat people who try to make sense of life. And I am glad I figured at least this much. i wish great season and new year to u too..